I am here to share with you the best life hack – ever. It’s so good because you can apply this one hack to every area of your life for massive results. It’s called The 80 20 Rule. And it’s something I try to talk about in in my Facebook Group for all the dream chasers because it’s a game changer. What is the 80 20 Rule? The 80 20 rule says that 80% of the results you get come from 20% of the work you put in. The rule isn’t that strict or rigid though. It’s not always going to be 80% to 20%. But it will always be that a disproportionate majority of results come from a minority of causes. The numbers do not have to be exact, nor do they have to add up to 100. It could be that 90% of outputs come from 30% of inputs, or 60% of outputs come from 5% of inputs. Inputs and outputs do not need to equal 100; they’re completely separate. This is a wide misconception of the 80 20 Rule. For more on that, see The Top 4 Misapplications of the 80/20 Rule by Scott Young via Life Hack. The point of the rule is that a minority of inputs cause a disproportionate majority of outputs. In 1906, Vilfredo Pareto, an Italian economist, found that 80% of the land in Italy belonged to 20% of the people. After more research, Pareto discovered that this principle applied to various things, not just wealth. And while it doesn’t work 100% of the time, it sure does work a lot of the time. While the principle varies in individual cases (it could be 80-30 in a specific instance, for example), this is a general rule that a lot of categories fall under. Sales: 80% of your profit comes from 20% of your clients. Customers: 80% of your problems come from 20% of your customers. Employees: 80% of your sales come from 20% of your employees. Work hazards: 80% of work injuries come from 20% of work hazards. Crime: 80% of crime is committed by 20% of criminals. 1. 80% of your relational happiness comes from 20% of your relationships. 20% of your relationships provide you with 80% of the happiness you have with respect to all of your relationships. Using this rule, you would maximize time and energy on the 20% of your relationships that contribute and give you 80% of your happiness, and minimize time on the 80% of relationships that aren’t contributing much to your happiness. 2. 80% of your weight loss comes from 20% of your exercise. If you’re trying to lose weight, and you’ve determined that what really causes you to lose weight is the 20% of your exercise that is intense cardio, you would want to stop doing the other 80% of exercise that isn’t producing results for you and focus on the 20% of intense cardio that is. There’s no point in balance for the sake of balance if you’re not getting the results you want. 3. 80% of promotions come from 20% of bosses. In Living the 80/20 Way by Richard Koch (see below), Koch states that it’s the 20% of bosses who are going somewhere (moving upward themselves) who are responsible for 80% of promotions. So, who you work for may be more important than what you do. You may want to consider this if you notice you’ve been stuck in them same position for a while, not getting the traction you want. 4. 80% of your grocery bill comes from 20% of the items you buy. This example comes from Trent over at The Simple Dollar – and it’s true! Next time you go to the grocery store, take a look at your receipt and focus on the 20% of items that cost 80% of your bill. If you’re trying to cut expenses, try to cut there or find a way to get them cheaper. This can lead to dramatically decreasing your grocery bill. 5. 80% of the clothes you wear come from 20% of your wardrobe. Say what?! This is another example from The Simple Dollar post. After thinking about this one, I realized it’s pretty much true. Take my work shoes as an example. I have 9 pairs and only consistently wear 2 (in the summer, 3). Why do I have so many?! I hadn’t thought about this until learning about the 80 20 Rule. Knowing this helps because the next time I think I “need” a new pair of work shoes, I can ask myself whether they’re replacing the ones I wear, and if not, I probably shouldn’t get them because I’m probably not going to wear them enough. 6. 80% of your income goes to 20% of things in your budget. Does most of your income go to only a few things in your budget? Your mortgage, car, credit cards, or student loans are examples of a few things that could take up most of your income. With this information you can focus on paying off debt so more of your money is freed up. The bottom line is that you can do less and get more. By focusing on the minority of things that cause the majority of results, you can save time and energy and focus on what’s most important to you. Identify areas in your life where there is an imbalance of results (or where you want to see a change). Consider the 8 main life categories, including: relationships, career, finance, health, personal development, environment, fun, and volunteering. Analyze the imbalance and determine the percentage of results you’re getting. Determine the minority of inputs that are causing the disproportionate results or effects. Create a plan to change your habits so you spend more time and energy on the minority of inputs causing the majority of results, and decrease time and energy on the 80% of things you do that lead to only 20% of results. The 80 20 Rule is the best life hack that exists because you can apply it to every area of your life to get maximum results (think: career, finances, health, etc.). The rule says that a majority of what you do doesn’t give you a majority of your results. It’s the small minority of work you do that gives you the most results. This is what I teach in Dream Year – my goal setting workbook that is different than any other goal-setting workbook out there. Instead of focusing on the stuff that doesn’t get you results, focus on the minority of what you do that leads to the majority of your results. Do this in every area of your life to 10x your success. I don’t use the 80-20 rule nearly as much as I should. It’s something I need to get better at. I remember reading about it in The 4 Hour Work Week. The author really pushed this rule and said we should be constantly analyzing what we are putting our energy towards. Yep! Tim Ferris in 4 Hour Work Week. It’s a good one, but it’s definitely hard to follow sometimes. You have to intentionally use it or you get bogged down with other things. I too cut out my lower paying hustles. At first it was hard because I make so little to begin with. But it gave me more time to secure other high paying pursuits. Totally worth it in the long run. Stefanie @ The Broke and Beautiful Life recently posted…What Can I Learn From My “Archetype”? Exactly, Stefanie! It was hard for me but it was definitely worth it because I have more time for myself and for other higher-paying side hustles. Right?! hahah. I mean I don’t have kids and I usually have one weekend night free where I don’t have plans, so it’s a win win! Excellent explanation of the 80/20 principal. This concept can be used to completely improve every single aspect of one’s life, and it especially applicable with respect to personal finance. You hit the nail on the head, we spend the vast majority of our income paying for just a few items, namely mortgage (housing) payments and car payments. Eliminate these and we find new wealth in the form of disposable income. Disposable income we can then invest in the 20% of assets that provide 80% of our returns. Great post! Absolutely! I’m working on getting out of debt. My student loans take up most of my income. Once those are gone my savings and investments will skyrocket. This is a great reminder, Natalie. I’m a bit of a self-admitted perfectionist and try to do it all, when I should be focusing on the 20% only. You write such great content! I’m always thrilled with some of your articles. I totally see this at work as well with blogging. It’s real easy to get focused on doing a bunch of little things that really have no impact to the growth of a blog. I’ve had to cut some things out that I really enjoyed doing but was seeing little impact from those efforts. Brian @ Luke1428 recently posted…Should I Leave An Inheritance To My Children? That is one of the hardest things for me to cut, Brian. I want to do it all when it comes to my blog, when really, if it’s not producing results, I shouldn’t spend the time on it. Most people spend their time focused on “the squeaky wheel” instead of examining the 80/20. I usually found that the 20% of things that were effective were so sublime that without focusing directly on them, I would have been spinning my wheels with the 80%…..(which is always where the “squeaky” stuff lives!). I’m just learning how to do that. As someone who stays “busy” and tries to do it all, this doesn’t come naturally to me. Now, I’m more focused on results and that’s how I end up doing more of the 20%. This rule is so true and it’s a great reminder that it applies in SO many areas of our life. In sales, I have always had 80% of my business come from 20% of my clients, so I definitely took care of those 20%. Now that my business is expanding, I have to do the same thing and remind myself not to run myself ragged trying to help everyone otherwise I will have no energy left for the important work. I’m very familiar with the 80/20 concept and do use it fairly often, especially when it comes to making money 🙂 But I haven’t used it towards groceries which would be interesting to note the result! Thanks for explaining the rule very concisely Natalie. I like the groceries example, too. For me, it’s a few toiletry items and meat that really get me. I’m not sure I’m ready to give up $15 cream or my meat though. Maybe eat meat less and being conservative in other areas to compensate. Either way, there is power in knowing! That’s so crazy about the grocery bill and the clothes. I’ve honestly never thought about either of them much. I think I’m such a minimalist from some many years of living on the road that the clothing one doesn’t really apply to me, but I’m totally going to check out my grocery bill this week. That seems like it would be a great starting point for couponers. I like the idea of focusing on coupons for the places that are most expensive in your grocery bill. Definitely a great way to be aware and save. 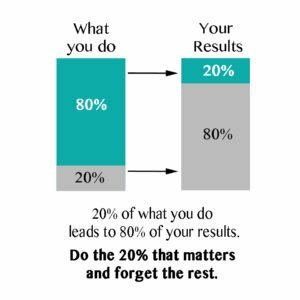 The 80/20 rule are words to live by. Every now and again I get stuck on something; whether its work, blogging, life, etc. Then I just remember the 80/20 rule and try to tackle the 4-5 biggest things that are eating at me. Not only does that help, but it really keeps me from stressing all the small stuff. That’s a great point. This rule can absolutely be useful during stressful times to help prioritizing and forgetting about the rest. The leaders at my former company definitely drilled the 80/20 rule into our heads. The sad reality is so many of us spend all of our time, energy, focus and money on the 80% instead of the 20%. I saw it with my clients and even employees. We were trained to spend our time with the employees who were driving results but the trouble employees were the ones who took all of our time. It’s not always easy following the 80/20 rule, but when you do, it makes a difference. It’s a really important point to say it’s not easy, Shannon. I think for me, it will be helpful to remember the 80 20 Rule when I’m losing focus or find that I’m overwhelmed. And if I can implement it more than that, that’s great, too! I started applying this principle a couple years ago when I wanted to focus on what I called “big rocks” which is taking on clients and jobs that pay more instead of killing myself time wise with a lot of small projects that don’t pay as much. Unfortunately I’ve had to go back at the moment to taking what I can get! Sometimes, you do have to take what you can get. But I think knowing how the rule can help can play a major role in speeding up success. I know if I lost my babysitting family, I would probably take a couple families who pay less until I found another one that pays more. The problem with me is identifying that important 20%, but maybe I should take a closer look at my finances… groceries for the most part. [email protected] DollarNinja recently posted…How Much Money Do I Need To Retire? Yes, Aldo – excellent point. Sometimes the 20% isn’t so obvious. I think if you look hard enough or look for a long period of time, it will become obvious. If not, perhaps the imbalance isn’t really there. Finances should be obvious because it’s numbers. That’s an interesting take on the rule. I’ve never thought of it outside of the traditional sales and marketing thinking. Maybe I need to focus on it but then I should stop blogging haha. To be honest I really wasn’t that familiar with the 80-20 rule but I love the idea. I’m definitely going to start looking at how the rule applies in my life. And wow $20/hr for babysitting??! That’s amazing. Maybe I should dust off my babysitting hat. Yea, before reading Tim Ferris’ 4 Hour Work Week (where he mentions it some) I wasn’t either. The Koch book is a good place to start. It was really helpful for me re clothing, too. Even if I really like something, I think about whether it fits into the 20% of items I actually wear. If not, I don’t buy it. Funny you say that – I took someone to have surgery today and was thinking how University Hospitals really could use the 80 20 Rule. They’re trying to provide a better experience, so they have a massage chair and free bagels and drinks / coffee. People come around and get your name to confirm who you’re there for. That was all great but the staff was extremely unhelpful when you asked questions such as where an office was or something related to your visit. And the nurses were very stressed and unorganized. It dawned on me that they’re focusing on implementing all these fancy things (like free food and a massage chair) to improve your experience (maybe to compete with the Cleveland Clinic?) but all they need to do – all anyone cares about – is how they’re treated. If the staff was kind, helpful, and attentive to the patients and family, that would be enough for me to rate them a 10. I don’t need a massage; I need good customer service. Instead of focusing on all these random things to make the experience better, they should focus on the one thing that matters – customer (or patient) service. Interesting concept…I’ve heard of some variation of it but you explained it in much better detail here. I need to keep a closer eye on this myself. Too often, I think I focus on things that are not that relevant or which won’t have much beneficial results. [email protected] recently posted…Are You a Sports Fanatic? I do that a lot, too. I think the more type-A you are, the more likely this probably is true. I naturally like to stay busy but maybe I’m busy with the wrong things! I had read before about the 80 20 rule, but I haven’t tried to apply it. I would try to use this one tomorrow because every Thursday is my grocery day. Teffany @ RideShare Guy recently posted…Are Lyft’s New Heat Maps A Good Thing For Drivers? I’m a huge fan of the 80/20 rule! We apply it to our home improvement work and general errands/chores. There is a level of detail that just doesn’t need to be done in order for the end product to look good. That’s such a great use for this rule, and I hadn’t thought about it until you mentioned it – thanks for sharing! This was such an interesting post, and I agree with all of it!